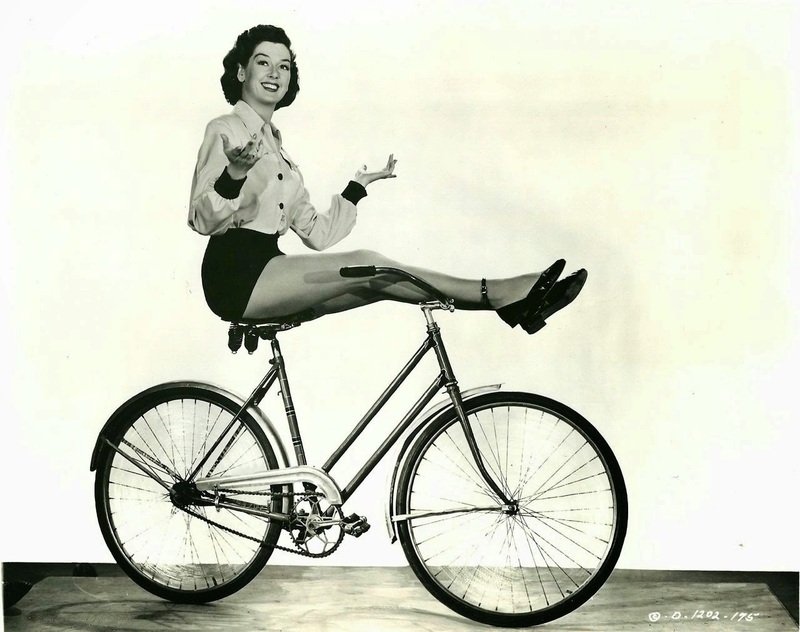 I can remember as a girl racing down a big hill on my bike, my feet balanced on the handlebars (something like Rosalind Russell in this photo), braids flying in the breeze, no helmet, no knee pads, The only protection I had in those days was a belief that I was invincable. I should have been concentrating. Instead, my only thoughts were on the show I would perform for my neighbors. Thunderous applause rang in my ears. 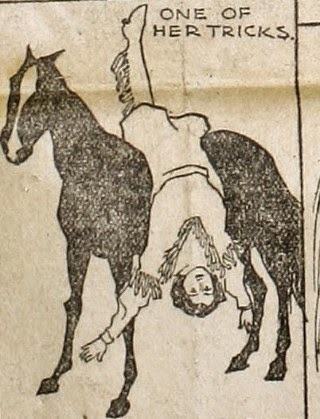 I'd start out slow then build to a dazzling cresendo akin to the wild west shows where the girls rode around a ring flipping back and forth across the horses back, turning circles, and standing up on the saddle with outstretched arms. When I was 9, I did more than just aspire to greatness. I was great. I never went through with my plans for a one-woman-dare-devil bike-a-rama. I never posted flyers on neighbors' doors, or sold tickets. For reasons I can't recall my illusions of grandeur faded like puffs of smoke from Annie Oakley's six shooter. Little by little, fear creeped into my consciousness. One of five children I learned that parents can only handle so much greatness. It has to be spread around. When one child is on top, the others need to be knocked down a few pegs. At best, it's Darwinian - a way for both parents and children to survive. At worst it is reality TVwithout the TV. The tentacles of fear tightened their grip after we moved to Florida where I discovered certain public bathrooms and water fountains in the South were labeled "colored." At 12, I became aware of the ins and the outs, the haves and the have nots. I learned that clothes from Rosenblums with a "Villager" label were more "in" than dresses my mom made on our dining room table. In junior high I caught on that knowing the right answer in English class and not being afraid to raise my hand put me smack dab in the middle of the "nerd" camp. A place the Villager set I wanted to like me avoided, or, worse, made fun of. And there's no denying that, even though I don't know the year it happened, I became fearful in my own home. I was afraid of mom's anger, of words used like weapons, of looking foolish, of speaking my mind or trying out new ideas, of rocking a boat on waters that looked smooth yet roiled underneath, of feeling emotions that made others uncomfortable, of speaking about the elephant in the living room. Oddly, when I felt the most fearful I became the most reckless. In order to fit in, I either kept silent or I ran with a beer-drinking crowd. In gym class I worried that my skinny thighs didn't touch (a belief in those days that one was not a virgin), but in the back seat of a Ford mustang skinny thighs were the last thing on my mind. I was too afraid to date boys my own age, but carried off an "adult" persona to woo and be wooed by a man 8 years my senior. A man I would love, marry, have children with and divorce while I tried to find my soul's desire that had been silent for so long. In the years since, like a kid on a see-saw, I've been up and down, fearful and brave, reckless and timid. our actions and lives are always the richer for it." Where oh where do I find the balance I crave? How do I throw off the mantle of fear, and learn to trust my own voice? How do I convince myself that I'm okay just the way I am? Does balance mean one way or the other, i.e. the point at which both sides are equal? 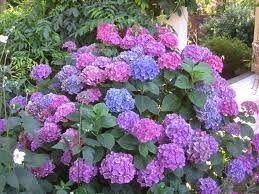 Or can it be a blending of the two, as in just enough pink and just enough blue make a perfect shade of purple? I sit here today on a threshold of new ways of thinking, acting and loving ME. How does balance look to you? For me, balance is like a pendulum which reflects the give and take flow of life and the events that show up in our lives. I was just thinking yesterday how since the first of the new year I was on such a high until a small element of fear has squeezed its way into my thinking and my guard went up. I was reminded that life will swing from high to low and back again. It is a natural part of the nature of living. For me, order helps me feel balanced. I think of order two ways: being organized and Divine Order. 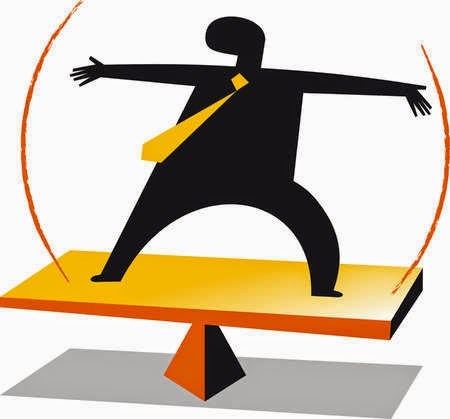 When I put things in order, I can focus better and feel more balanced. When I affirm that Divine Order is already active and available, I can trust that and tap into my purpose for the day. Your reflections provide a lot to think about! Beautiful writing, again! Love the images.